Eat your Wheaties, Go Go’ers, because it’s gonna be a marathon of downtown fun Thursday night. 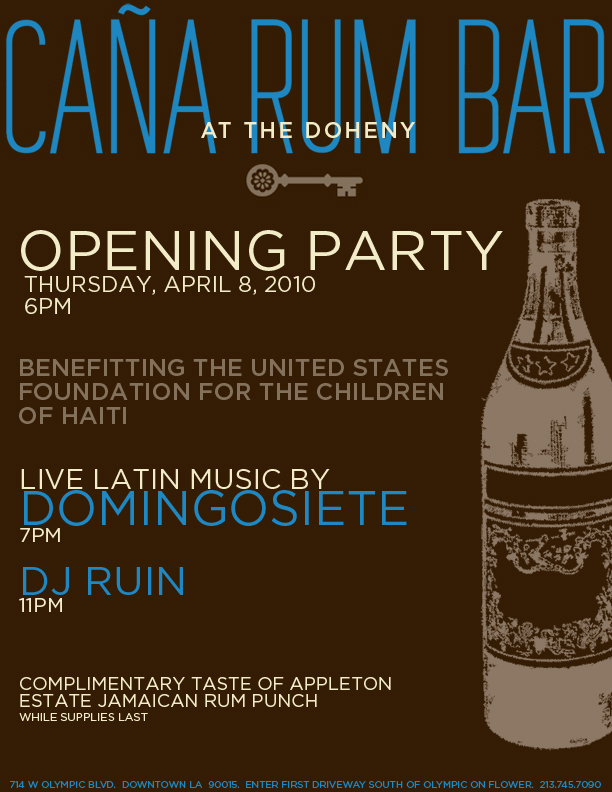 The usually exclusive/private Doheny kicks off the evening with an inclusive/public opening party for the Cana Rum Bar: a benefit for the United States Foundation for the Children of Haiti. A one-time $20 fee confers a one-year membership in the Cana Rum Society; think great, handcrafted rum cocktails, Tiki rum punch and spirits (rum yum yum, in other words) plus evites to rum tastings, spirit education (presumably, the drinkable kind, not the ectoplasmic kind), and special events. The evening includes a complimentary taste of Appleton Estate Jamaican Rum Punch (while supplies last), plus music by Domingosiete at 7PM and DJ Ruin at 11PM. Go Go’ers, let the Conga line begin…..
Post-lecture, wend your way to the Downtown L.A. Art Walk. Highlights include: Pedals and Prints, a multi-artist show curated by Two Rabbits Studio at Crewest; the de LaB sale at Ball-Nogues Studios, where you can find products for sale by architects, designers, illustrators and artists working east of La Brea, and the Plasticgod post-Art Walk exhibit and party with large- scale art works, dj and dancing and (rumored) red velvet cupcakes. Go Go’ers, start your engines…. Bring in printed map for Jarritos soda! Previous Post John Fante Square/Free walking tour/King Eddy Saloon: Fante-stic Fete! Next Post Film Noir @ American Cinematheque/L.A. Noir @ Esotouric: Down these crooked streets….